Vocal Strength & Power (with audio download) : Based on years of teaching and research, this book/downloadable audio pack by acclaimed vocal coach Dena Murray provides insightful methods and exercises for attaining vocal mastery. Perfect for all singers - beginners to pros - who want more power in their voice, better pitch control, and a bigger singing range. 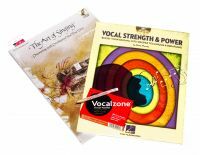 With her prior two books, this volume forms a complete set of exercises to bring the voice to its full potential. The Art of Singing (with CD): Another of our best sellers, this book delves deep into not just vocal technique, but also the complex relationship between an individual and their voice, with the aim of helping you to discover and develop your 'true voice'. Includes a 65-track CD. Vocalzone: Vocalzone Throat Pastilles are a unique blend of natural ingredients formulated to provide powerful relief from irritated throats caused by excessive singing and speaking. Vocalzone is ideal for professional and amateur singers. Vocalzone can also relieve the irritation of the throat caused by the common cold. Vocalzone is the only throat pastille available in the UK that contains Myrrh as an active ingredient. Myrrh is anti-inflammatory, analgesic, antiseptic, astringent and antimicrobial. Myrrh has been used to treat sore throats, inflamed gums, tonsillitis and mouth ulcers for many years.